The captains. The staff. The crew. The smiles. The attitude. The genuine friendliness. Ask Azamara guests what they love most about their voyages, and you'll hear answers like these. So we thought we’d tell you more about the people who make an Azamara voyage so different from the rest. Because we think they're pretty special, too. Be sure to check back to meet more members of our award-winning staff and crew. 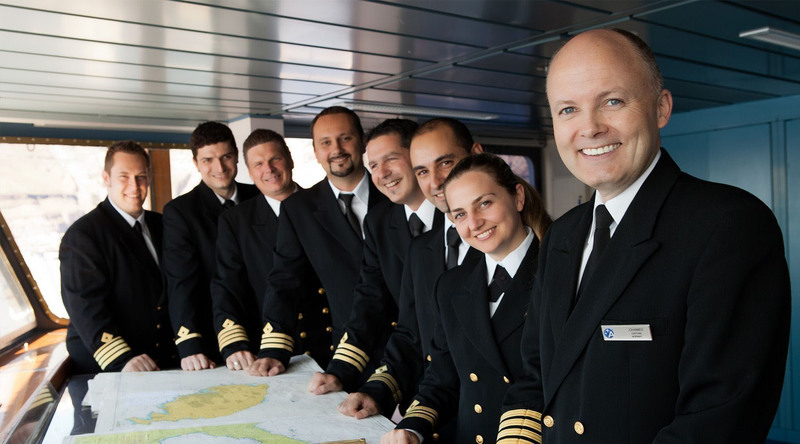 Captain Magnus Davidson became Master of the Azamara Journey in late-2015. His love of the sea, travel, Destination Immersion® experiences, and good food, as well as his easy manner and quick sense of humor makes him the perfect new addition to the Azamara family. Welcome Aboard, Captain Magnus! This year he'll be the first Manx captain to bring a cruise ship home to the Isle of Man. Learn more about the one-and-only Captain Carl Smith. It was almost a foregone conclusion that Johannes Tysse would be a sea captain. Learn how the job he dreamed about from an early age is a platform for creating unforgettable experiences for Azamara guests. Fred found his passion for travel at an early age, and considers himself luck to have made a career out of it. Discover a typical day in the life of a hotel director, and which Azamara itinerary is at the top of his list. Hotel Managers are the sum of their training, experiences and opportunities. Ryszard (pronounced ‘Richard’) Gusmann understands this perhaps better than anyone. Beginning his career in the cruise industry in 1991, Tomasz brings a wealth of hospitality experience from both land and sea. He says the best advice he's ever received permeates his approach to guest service, and he can't wait to go on safari with his wife next year. With a background in 5-star hotels and Jordanian palaces, German-born Elisabeth Vogel brings an exceptional commitment to outstanding service to Azamara PursuitSM as hotel director. Discover how she spends her time on shore, and the cuisine she can’t get enough of. A performer since the age of five, Alicia invests her heart and soul into her role as Cruise Director on Azamara Journey. From her favorite music and food, to port cities she's visited, learn more about our perennial performer that hails from Tulsa, Oklahoma. Some people are naturally curious and eager for new experiences. Tony Markey is like that. Born with itchy feet, as his mother would say. Grab a snack, because you’ll get hungry as you read this interview with Azamara’s Corporate Executive Chef Robert van Rijsbergen. He was born for this early and lifelong passion for fine cooking and the sea. Bon appétit! She's a fourth generation Mexican-American and comes from a big family in Texas with five sisters. Growing up, her grandmother was always cooking Mexican feasts for people and she was at her side when she could be. Originally from the Netherlands, Chef Iwan spent his family vacations along the Adriatic Coast of Italy and found his way into the kitchen of the hotel he stayed in. No stranger to the demands of cooking for large groups, he’s worked in Michelin-starred restaurants and has a favorite dish in mind if he ever lands on Top Chef. Growing up in the culinary capital of the Philippines, Chef Michael Calilung was inspired by beautiful food he saw on TV, and supported by his mother to pursue his international career as a chef. With a passion for discovering new ingredients and dishes, Chef Michael considers the Azamara crew his family at sea. Chef Colin fell in love with travel, food, and life at sea from being on ships with his father. Not one to sit around, he loves embarking on outdoor adventures with his wife. Read on to learn the dishes his guests say are their favorite, and a recipe he loves to make. Hailing from mountainous Northern India, Chef Limboo’s family instilled a love of cooking in him at an early age, and encouraged him to follow his passion and talent across India and the United Arab Emirates. When not on board, you can find him cooking for his family at home using the freshest local ingredients.